Also serving communities of Ocklawaha. There are 31 Assisted Living Facilities in the Summerfield area, with 2 in Summerfield and 29 nearby. To help you with your search, browse the 313 reviews below for assisted living facilities in Summerfield. On average, consumers rate assisted living in Summerfield 4.6 out of 5 stars. Better rated regions include Hernando with an average rating of 5.0 out of 5 stars. Caring.com has helped thousands of families find high-quality senior care. To speak with one of our Family Advisors about assisted living options and costs in Summerfield, call (855) 863-8283. Summerfield is a small city in Florida, located approximately one hour northwest of downtown Orlando. Close to many bodies of water, including Lake Weir, Lake Panasoffkee and Lake Griffin, Summerfield is ideal for seniors who enjoy fishing, boating and other water recreational activities. For those who want to retire in the area, there are 46 assisted living facilities, including two within the Summerfield city limits. Regulated by the Bureau of Health Facility Regulation, assisted living facilities in Summerfield and the state of Florida operate under a standard license to provide routine personal care, or under a specialty license, which includes limited nursing assistance and extended congregate care. The Summerfield area is home to world-class medical facilities, including AdventHealth, in the event of medical emergencies or illness. Summerfield has an array of community resources for seniors, including Marion Senior Services, an organization that provides meals and transportation as well as one senior center. The overall crime rate is 15 crimes per 1,000 residents, which is comparable to the average of all cities and towns within the nation. Seniors can feel safe within Summerfield with approximately a 1 in 66 chance of becoming a victim of any type of crime. The cost of living in Summerfield is 96.8, which is lower than the national average of 100 and lower than the state average of 111. Seniors on a budget may find Summerfield an affordable place to live. Seniors who live in Summerfield will enjoy easy access to the outdoors nature all year round. Summers are hot and humid with highs around 91 degrees Fahrenheit, while winter lows are around 45 degrees. Like most Florida cities, spring and summer afternoons in Summerfield are prone to brief rain showers, which brings the average rainfall for the city up to 51 inches a year. This is higher than the national average of 39 inches. Marion Transit operates ADA accessible buses for seniors in Marion County at discounted rates. Trips may be scheduled as early as two weeks In advance or as late as 72 hours beforehand. Ongoing trips to dialysis and other therapy treatments may be set up on a permanent schedule. Assisted Living costs in Summerfield start around $0 per month on average, while the nationwide average cost of assisted living is $4,000 per month, according to the latest figures from Genworth’s Cost of Care Survey. It’s important to note that assisted living rates in Summerfield and the surrounding suburbs can vary widely based on factors such as location, the level of care needed, apartment size and the types of amenities offered at each community. 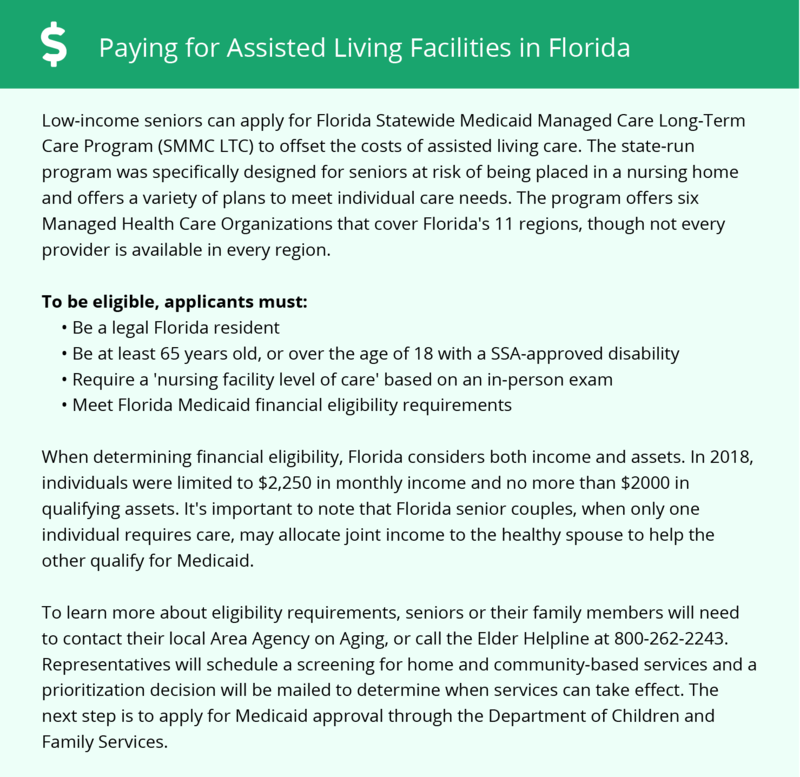 In Summerfield and the state of Florida, financial assistance is available for eligible seniors to pay for an assisted living facility. For residences that operate under a standard license, the Medicaid Managed Care Long-Term Care Program is available. The Assistive Care Services Plan is available for those that operate under a specialty license. While neither plan covers private rooms, family supplementation is permitted. Summerfield and the surrounding area are home to numerous government agencies and non-profit organizations offering help for seniors searching for or currently residing in an assisted living community. These organizations can also provide assistance in a number of other eldercare services such as geriatric care management, elder law advice, estate planning, finding home care and health and wellness programs. To see a list of free assisted living resources in Summerfield, please visit our Assisted Living in Florida page. Summerfield-area assisted living communities must adhere to the comprehensive set of state laws and regulations that all assisted living communities in Florida are required to follow. Visit our Assisted Living in Florida page for more information about these laws.